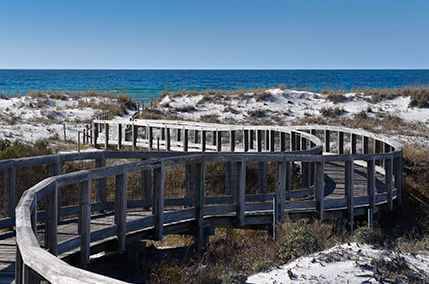 Nestled adjacent to Deer Lake State Park, WaterSound West Beach features long wooden boardwalks that wind through towering white sand dunes to a sparkling private beach. This gated St. Joe Community is located entirely on the south side of Scenic Highway 30A and includes only 199 planned homes. With a classic maritime style, West Beach homes are painted in muted tones that blend with the local landscape and offer luxurious and accommodating details. Community amenities include a zero-entry community swimming pool with grill area and fire pit, a puttering park, nature trails and access to the WaterSound Beach fitness center. The Premier Property Group is Santa Rosa Beach's most innovative real estate team. © 2019 Emerald Coast Association of Realtors MLS. All rights reserved. IDX information is provided exclusively for consumers' personal, non-commercial use and may not be used for any purpose other than to identify prospective properties consumers may be interested in purchasing. Information is deemed reliable but is not guaranteed accurate by the MLS or The Premier Property Group. Data last updated: 2019-04-23T00:03:24.54.